We return to our monthly examination of storage performance, and this month’s topic is Exchange 2010 performance comparing results from the latest ESRP v3.0 (Exchange Solution Review Program). This latest batch is for the 1K-and-under mailbox category and the log playback chart above represents the time it takes to process a 1MB log file and apply this to the mailbox database(s). Data for this report is taken from Microsoft’s ESRP v3.0 website published results and this chart is from our latest storage intelligence performance dispatch sent out in our free monthly newsletter. Smaller is better on the log playback chart. As one can see it takes just under 2.4 seconds for the EMC Celerra NX4 to process a 1MB log file whereas it takes over 7.5 seconds on an EMC Iomega IX12-300r storage subsystem. 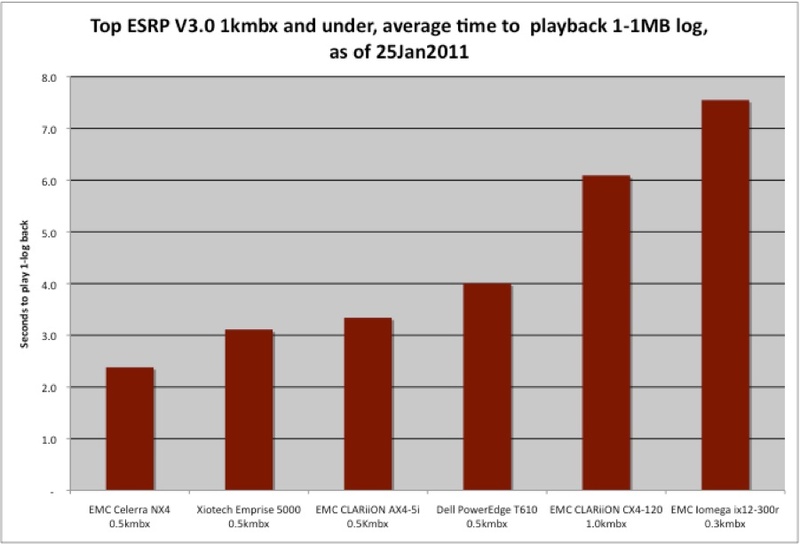 To provide some perspective in the next larger category, for storage supporting from 1K-to-5K mailboxes, the top 10 log playback times range from ~0.3 to ~4.5 seconds and as such, the Celerra NX4 system and the other top four subsystems here would be in the top 10 log playback times for that category as well. I have come to believe that log playback is an important metric in Exchange performance, for mainly one reason, it’s harder to game using Jetstress paramaterization. For instance, with Jetstress one must specify how much IO activity is generated on a per mailbox basis, thus generating more or less requests for email database storage. Such specifications will easily confound storage performance metrics such as database accesses/second when comparing storage. But with log playback, that parameter is immaterial and every system has the same 1MB sized log file to process as fast as passible, i.e., it has to be read and applied to the configured Exchange database(s). One can certainly still use a higher performing storage system, and/or throw SSD, more drives or more cache at the problem to gain better storage performance but that also works for any other ESRP performance metric. But with log playback, Jetstress parameters are significantly less of a determinant of storage performance. In the past I have favored database access latency charts for posts on Microsoft Exchange performance but there appears to be much disagreement as to the efficacy of that metric in comparing storage performance (e.g., see the 30+ comments on one previous ESRP post). I still feel that latency is an important metric and one that doesn’t highly depend on Jetstress IO/sec/mailbox parameter but log playback is even more immune to that parm and so, should be less disputable. Where are all the other subsystems? You may notice that there are less than 10 subsystems on the chart. These six are the only subsystems that have published results in this 1K-and-under mailbox category. One hopes that the next time we review this category there will be more subsystem submissions available to discuss here. Please understand, ESRP v3.0 is only a little over a year old when our briefing came out. The full performance dispatch will be up on our website after month end but if one needs to see it sooner, please sign up for our free monthly newsletter (see subscription widget, above right) or subscribe by email and we’ll send you the current issue along with download instructions for this and other reports. Also, if you need an even more in-depth analysis of block storage performance please consider purchasing SCI’s SAN StorInt Briefing also available from our website. As always, we welcome any constructive suggestions on how to improve any of our storage performance analyses.